12.1MP, 14x zoom and 1080p video. Could this be the only camera you need? Alongside the megapixel race that has headlined the past few years of digital photography, manufacturers have strived to outdo each other in the lens department, too. Whereas once Ricoh and Panasonic were the only companies with acclaimed superzoom compacts as part of their ranges, today almost every manufacturer offers a small-format, high-zoom alternative, typically sweetening the deal with HD video, GPS functionality and a range of manual control. Canon's rejoinder to all this has been its PowerShot SX series of cameras, which began life as an extension to its existing budget PowerShot models, before targeting a more discerning audience with bridge-camera models sporting bigger zooms and a more impressive spec sheet. 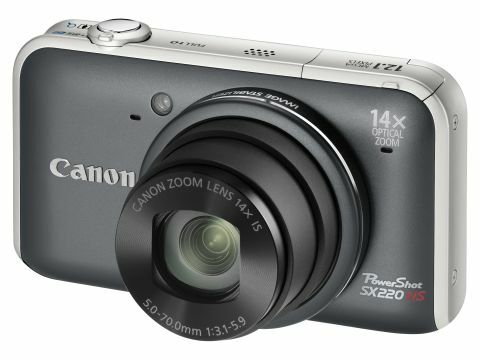 The range has since been broadened to offer a pocket-friendly alternative between the two, and the Canon SX220 HS is one of two new members (the other being the SX230 HS, which is identical in specification to the SX220 HS save for the addition of GPS functionality). Not only does the SX 220HS boast a 14x optical zoom, which offers a respectable range of 28-392mm and stabilisation courtesy of Canon's Optical IS system, but it's also one of the latest compacts to offer Canon's High Sensitivity technology. This is centred around a 12.1MP CMOS sensor, whose backlit construction moves the wiring from the front to the other side of the substrate, where it presents no obstacle for incoming light. This in turn heightens its sensitivity, which theoretically broadens its latitude for shooting in lower light, where the use of a tripod or flash would be otherwise required. Canon also underlines the benefit of using 'only' 12MP so that each photosite can be larger, and claims that its DIGIC 4 processing technology helps get the most out of the technology when it comes to dealing with images and videos. On the subject of the latter, full HD capture (1080p) is possible at a frame rate of 24fps, while a 30fps option captures at the lower 720p standard. Super Slow Motion options are also included, with a 120fps setting at the 640x480 VGA resolution and 240fps at 320x240, and stereo sound recording is possible thanks to a pair of microphones located beneath a grill on the top plate. Elsewhere, the camera offers a wealth of exposure control to suit all abilities, from Smart Auto functionality, said to instantly recognise the scene and match it to 32 presets, right through to a fully manual setting. Sensitivity may be adjusted over a range of ISO 100-3200, while metering may be varied between evaluative, centre-weighted average and spot patterns. On the rear of the model lies a 3in widescreen LCD, its aspect ratio designed specifically for 16:9 movie recording, while all images and videos are recorded to SD, SDHC and SDXC media. As is standard for such a camera, Canon has also provided it with a rechargeable lithium ion battery, which is said to last for around 210 shots once fully charged.